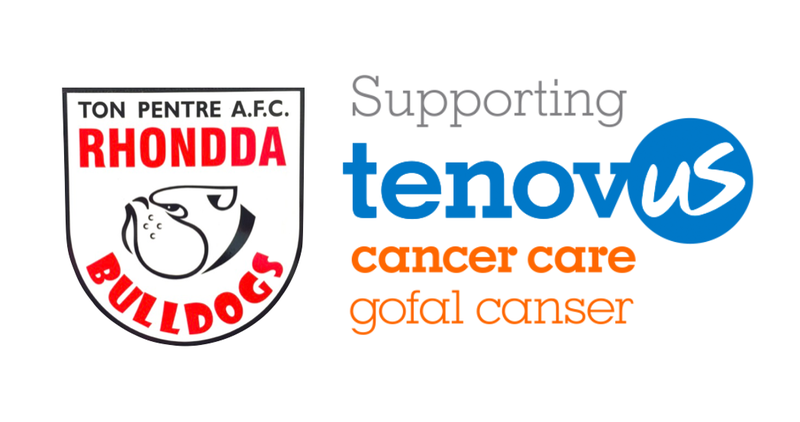 Ton Pentre AFC is delighted to announce its charity partnership with Wales’ leading cancer charity, Tenovus Cancer Care. The Rhondda Bulldogs will be supporting them through match day bucket collections and at plenty of other exciting club functions and events. Ceri Jones, the Chairman of Ton Pentre AFC, warmly welcomed the new partnership and said: “Tenovus Cancer Care is one of the most innovative charities in the UK and it does some extraordinary work in the community in the way it supports cancer patients, survivors and their families. Verity Imm, Community Fundraiser for South East Wales, is excited about the collaboration and added: “We want to thank Ton Pentre AFC for choosing us as its charity partner. We’re always excited by new partnerships with local organisations and really appreciate the support. “Tenovus Cancer Care brings treatment, emotional support and practical advice to where it matters most; the heart of the community. Without partnerships like this, we wouldn’t be where we are today. If you need support or advice from Tenovus Cancer Care their Freephone Support Line number is 0808 808 1010 and is open to anyone affected by cancer. Please also take time to visit their website by clicking here.